With all those little Thai chilis coming into their own and my Thai Basil at its peak I’ve been trying to use as much of them both as possible. Especially since one of my primary recipes is off limits this year. With our exceptionally warm summer here in the Northwest, shellfish is pretty much banned for now – the warm water creates a bacteria that affects the little guys and so my normal consumption of Thai Mussels is non-existent this year. But there are a million ways to use the ingredients and one of my favorites happens to be one of the easiest. Sauté the onion in a little olive oil over medium high heat. When it starts to get soft, add the garlic and Thai Hots. Sauté until onion is just starting to turn golden. Remove from pan and reserve. Add a bit more oil to the pan. Add about 1/2 of the beef, making sure you don’t crowd it. Sear it just 2 to 3 minutes on each side – you want it browned but not cooked all the way through. Remove from the pan and reserve. Repeat with remaining beef. When the final batch of beef has been browned, leave it in the pan, and add back the reserved beef and onion mixture. Add about 2 tablespoons of fish sauce and 2 tablespoons of black vinegar to the pan. Roughly tear the Thai basil and add it to the pan. Stir until all the beef and vegetables have been coated with the liquids. Continue cooking until the basil is starting to wilt and the liquids have thickened slightly. 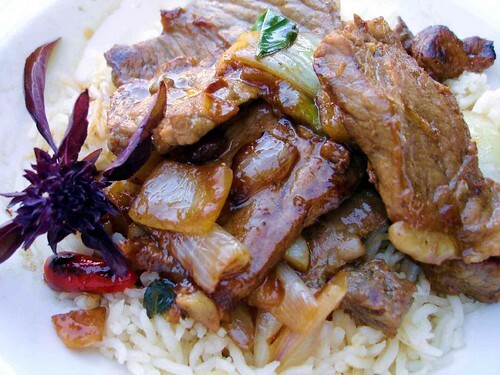 Serve the beef over the cooked rice. For additional flavor, cook the rice in chicken stock and add a splash of black vinegar and fish stock to the pan.